Washington State has one of the most archaic tax systems in the country. For being such a seemingly progressive state – having an elected gay mayor, a well received marriage-equality law, and legalized pot – we can’t quite seem to figure out that our tax system, unlike our other chic merits, just doesn’t match our cool Washington vibe. That’s because Washington has the most regressive tax system in the country. For those that don’t know, regressive taxation means that a larger percentage of Washington tax dollars comes from low-income residents than from high-income residents. According to the Institute on Taxation and Economic Policy (ITEP), the poorest 20 percent of non-elderly Washingtonians pay 17 percent of their income in state taxes and the richest 1 percent pay under 3 percent. Essentially, our tax system is setup so that the poorest households pay six times the effective tax rate of our state's wealthiest and our middle class pays nearly four times that rate. In addition, residents who live below or just above the poverty line still have the same expenses as those of high income status, meaning food, clothing and gas, takes a bigger toll on them. Because Seattle has the third highest sales tax in the country, at a whopping 9.6 percent, the lower your income, the more of it you will be spending on those taxable goods and services. With regressive taxes, not only do the poor get the short end of the stick, but the state has less revenue for things like education. It means that bills that fight for things like affordable community college die in legislation. So why does Washington have such regressive taxes? While there are a myriad of reasons, two undeniable factors are that voters are too scared to implement a personal income tax and the state’s tax system is one that was designed for a pre-grunge listening, non-weed smoking, 1950s Washington. The biggest reason though, is fear. As one of only seven states in the country that does not have a personal income tax, Washington has consistently voted against taxing it’s wealthiest residents. In 2010, Bill Gates’ father devised a plan, titled I-1098, to create a five percent tax rate on individuals who earned over $200,000 and a nine percent tax rate on income over $500,000. Of course, the state’s major employers – Boeing, Microsoft, Alaska AIrlines, and Amazon – all contributed to the campaign’s opposition. 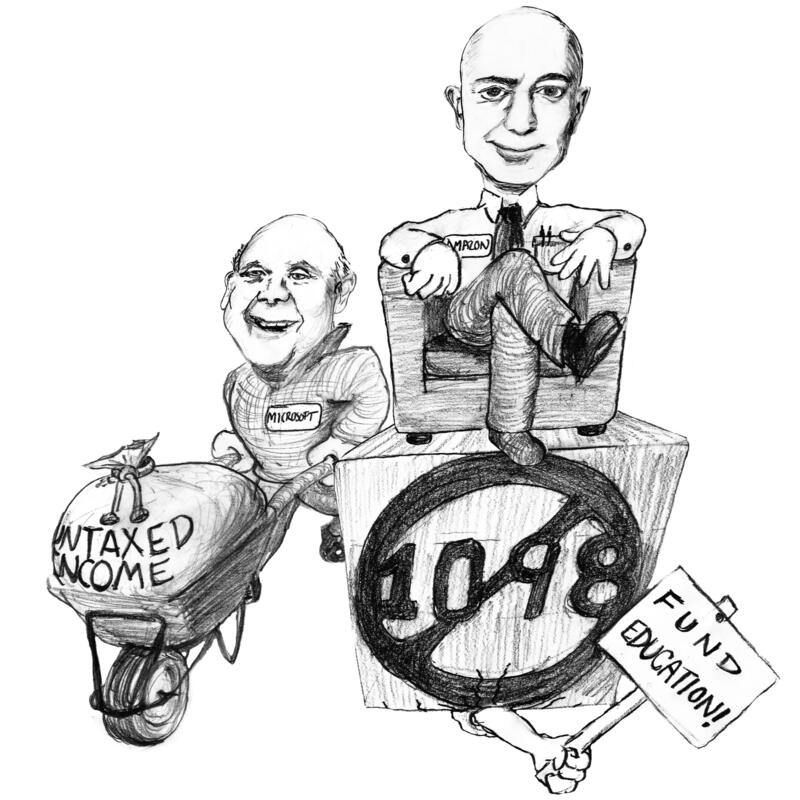 Fearing that a tax on high-earners would hurt their ability to lure talented workers to the state, Microsoft fat cats Paul Allen and Steve Ballmer as well as Amazon CEO Jeff Bezos, dumped hundreds of thousands of dollars into “Defeat 1098.” While Gates’ plan would have only affected 1.2 percent of the state's population, corporate billionaires helped scare voters into thinking that the state would eventually lower the $200,000 or more annual income mark. According to Gates senior, the initiative would have raised approximately $11.2 billion over the course of five years and this money would have funneled into state education and healthcare services, which the state desperately needs. In addition, 1098 would have cut the state portion of property taxes by 20 percent, meaning that for a King County homeowner, the annual property tax would have been reduced by about four percent, yet us voters seemed to not care about this either. With an ever expanding Amazon campus in downtown Seattle, shares of Expedia stock soaring, and plans for a new 2,000 person Facebook site on Dexter avenue, Seattle’s booming tech industry needs to face one of two realities; buck up to a state income tax or endure a corporate income tax. Either one of these would produce revenue for things that a cool state like us should be able to afford, such as free community college and better pay for teachers. With Washington having one of the worst education rankings in the country, it’s obvious that the system requires additional revenue. It’s time we gave locals the education necessary to compete with the highly trained people who flock here to take the high-tech jobs we create. With an estimated 71,000 Amazon employees to be working in the state of Washington by 2021, a majority of whom will be software development engineers averaging $90,000-$120,000 a year, the state should not be worried about “scaring away” talented workers. We have 47 very taxable billionaires who can take the heat.